Title text: "...an effect size of 1.68 (95% CI: 1.56 (95% CI: 1.52 (95% CI: 1.504 (95% CI: 1.494 (95% CI: 1.488 (95% CI: 1.485 (95% CI: 1.482 (95% CI: 1.481 (95% CI: 1.4799 (95% CI: 1.4791 (95% CI: 1.4784..."
I wonder whether you could meaningfully formulate a distinction between situations where the outer bounds of these error intervals converge or diverge. And if so, whether you could somehow arrive at an alternative derivation of the Heisenberg uncertainty principle that way. The first thing that comes to mind is that this is a type of fractal, though I don't think Randall implied the error-error would be iterated to infinity. But yeah, it could be convergent either way. Do a search for convergent fractal and you'll find plenty of examples. EDIT: Just noticed the ellipsis at the end of the title text. So yep, this is a fractal. Or a convergent series, if you want to view it numerically. Heimhenge wrote: The first thing that comes to mind is that this is a type of fractal, though I don't think Randall implied the error-error would be iterated to infinity. But yeah, it could be convergent either way. Do a search for convergent fractal and you'll find plenty of examples. My first impulse was to try to figure out the L-system generator for it. This comic explains a lot. Well, maybe not a lot, but at least it explains political polls. Xe got brought before the Grand Canonical Ensemble, but they didn't have the proper confidence level. This is what happens when you use frequentist methods. Bayesians have no trouble propagating errors. ksvanhorn wrote: Bayesians have no trouble propagating errors. I thought that was the internet? 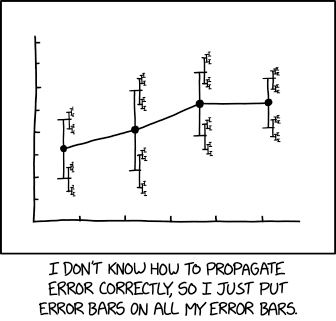 "Yo Dawg, I heard you like error bars"
Should I be proud that I am the first one on this thread to mention this meme, or sad that this probably indicates how out of date my cultural references are? "The Error Mars are on me!" Decided against ♬We are the Error-barries…♬ or "You can have an color [bar], so long as it's black.". Tbis one will be confusing enough.